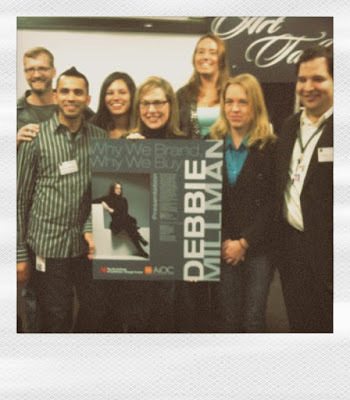 On Friday evening at the Art Institute of California - Orange County in conjunction with the Orange County chapter of AIGA, Debbie Millman gave a presentation titled, "Why We Brand, Why We Buy". Debbie's talk was a combination of brands, science and history brought together to help explain modern branding and consumer actions given with passion and enthusiasm. The talk was an excellent presentation that felt more like a graduate lecture which was fresh and informative. If you expect a show and tell presentation look at Sterling's website, this lecture informed, elated, and left me thinking more about how what we do ties all together. Debbie's presentation discusses how we think and group together, how trademarks developed and how technology and society join to make brands a reflection of the times. Debbie's talk is one that should not be missed and showcases how design is something that solves a problem and reflects the needs of our clients. After the lecture, a mixer event was hosted nearby where Debbie signed books. Debbie is so gracious, intelligent and generous. I truly cherished my moments speaking with her and getting to know this wonderful designer, educator and leader. I look forward to meeting and hearing her speak again soon. 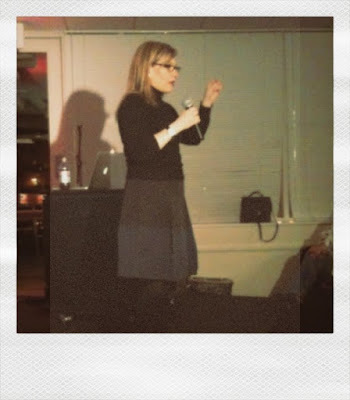 If you have the chance to catch Debbie Millman speaking, do it, you will not be disappointed, I was far surpassed in my expectations of a typical speaking event. We all get wrapped up in our own little boxes and churn out the designs but a way to gain fresh insight is to attend a lecture. As designers we love to talk and we love to talk about what we are doing, have done and then talk some more. This avails us to have the opportunity to go and listen to a fellow designer / artist to talk. Check you local colleges, AIGA and art museums for lists of upcoming guest speakers. Most of these events are low in price or free, in the evenings so they don't take up a ton of time and many are very small and intimate. Over the recent pass I have had the pleasure to hear Ellen and Julia Lupton, John Van Hamersveld, Andrew Christou, and Jon Gothold speak. You will find out new information, make some friends and enjoy this profession we call design. 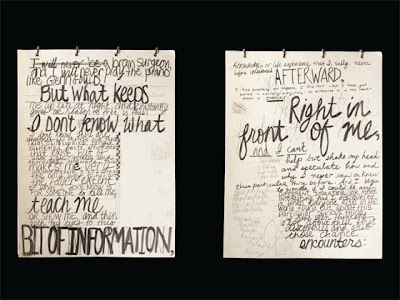 Get your creative mojo going tomorrow night by coming to hear the fabulous Debbie Millman speak at AICA-OC. More details are available at this link. 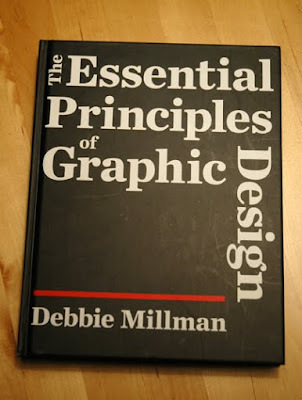 Don't just a book by its title, The Essential Principles of Graphic Design by Debbie Millman is more and than some. 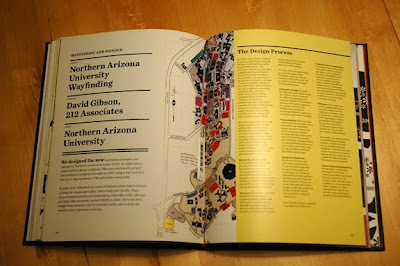 You might think that this book is one you would get for your introduction to design class but it goes to well beyond. 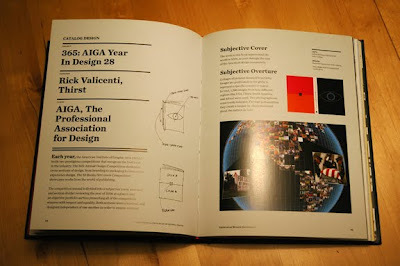 The book does start out covering several key principles of design such as typography, color, layout and style but then leads into such important areas of design as research, visual strategy and account management. This is great information that will not be covered in you old intro class. From this prelude, we get to the meat of the book, a section where design principles are discussed and examined within 32 disciplines. These disciplines include catalog design, packaging, environmental design, restaurant identity, museum exhibit design, personal blog design, magazine design, and poster design to name a few. The disciplines are explored by different designer and firms such as Armin Vit and Bryony Gomez-Palacio, Hillman Curtis, Hoefler & Frere-Jones, Luba Lukova and Khoi Vinh. Each section explains how the designer approaches a project, what they found that works and even what does not work at times. You get an in-depth look in the projects. 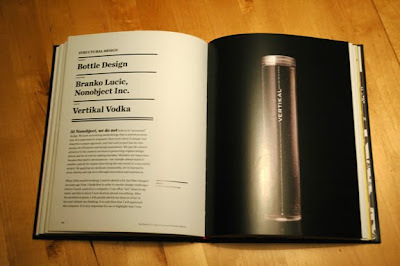 Most design books you find are filled with glamor shots of projects. These are always important for gaining ideas and inspiration but we don't get the how and why most of the time. 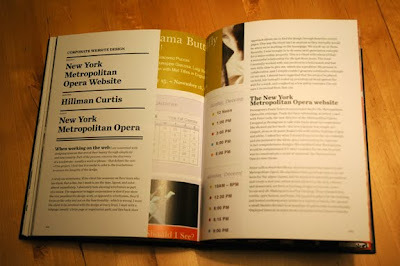 The Essential Principles of Graphic Design does give you the how and why. Debbie's The Essential Principles of Graphic Design is full of insight, words of wisdom and ideas on how and why to complete the communication challenge. "Art is Work" as Milton Glaser has stated and this book will give you the acuity to get both the art and work done. The Essential Principles of Graphic Design is available at amazon and your local bookstores. 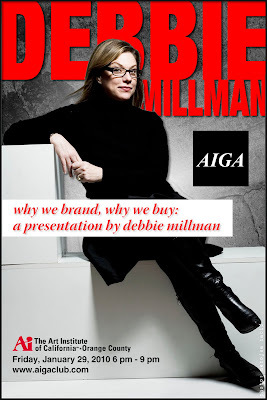 Debbie Millman took over as the National President of AIGA last year. I believe that Debbie represents design in its best light and gives the organization a new energy and direction. I am sure the job is a demanding one, but Debbie brings with her many years of experience and understanding to this position. She has worked as the President at Sterling Brands since 1995. At Sterling Brands her clients have included Gillette, MTV, Star Wars, Nestle, Pepsi and Campbells. Debbie has taught courses at SVA and FIT over the years gaining an understanding of our young designers and what they desire from a national organization like AIGA. She has given more talks at conferences that I am sure she can keep track of sharing her ideas on design and branding. She has contributed to our knowledge base with books, articles for design magazines and as a contributing editor of Print Magazine. Put this all together and you find someone who can take the AIGA to its next level. Someone with the energy and passion of our profession to communicate not only to fellow designers but the world around us that uses our talents. I believe one of the major missions of AIGA is to help get the word out of how design does matters and should play a key part in the decision processes of business and social issues. I believe that Debbie is helping with spreading the word and has already made the steps to help bring the organization to a new position in the minds of designers and those that use our skills. Design does matter and Debbie Millman has been spreading this idea for several years with her Design Matters radio broadcast. I can not remember when I first came across the Design Matters interviews, but I got caught in the web of design and interview questions that Debbie presented to some of our most influential designers working today. I have been a steady listener ever since. 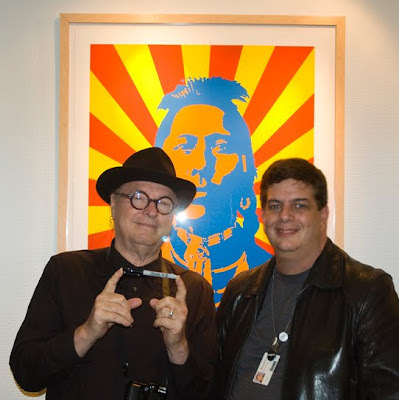 Interviews that Debbie has presented include Stefan Sagmeister, Paula Scher, Michael Bierut, Steven Heller, Ellen Lupton, Ed Fella, David Carson, Art Chantry, and my favorite Milton Glaser. I had the privilege of taking Milton's Summer Design course at SVA back in 2007 and gained a good understanding of this man's passion and thought. Milton is a true lover of design and art, an educator, and a humble man that is intellectual on many fronts. I can state that Debbie's interviews reveal these great designers and their thoughts extremely well based on my experiences with Milton. 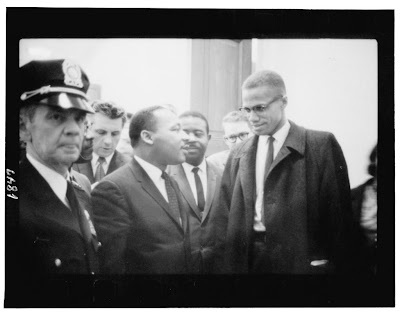 The Design Matters series has recently been tied in with the great blog, Design Observer. All of the Design Matters interviews are available to listen to or download to your favorite device. I have spend many a dinner break between teaching classes getting caught in the web of these interviews, loosing track of time and enjoying every minute. 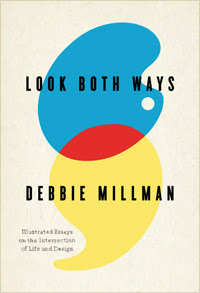 Look Both Ways may have been the advice your mom gave you prior to crossing the street, but in Debbie Millman's newest book of this title, it is the intersection of design and our everyday life that comes alive. Look Both Ways is a series of short stories were Debbie relates how design and branding have become a part of her life. We learn how to properly eat Keebler Fudgetown cookies and the observations of a youth about the package design. A simple observation that leads to Debbie actually designing packaging for many of our biggest brands. "The Illustration on the front panel of the cookie package, which showed the Keebler Elves holding a package of Fudgetown cookies. This meant that the Keebler Elves were holding a package of Fudgetown cookies featuring the Keebler Elves holding a package of Fudgetown cookies. And so on and so on and so on..... This killed me!" Another chapter goes into the summer long production of a young teenager producing a magazine. Interviews are made, he stories are all handwritten and illustrated with a close friend. A one of a kind design is produced. The book is full these short observations, about life, food, music, clothing, growing up and how it all plays a pivotable intersection in Debbie's world of design. 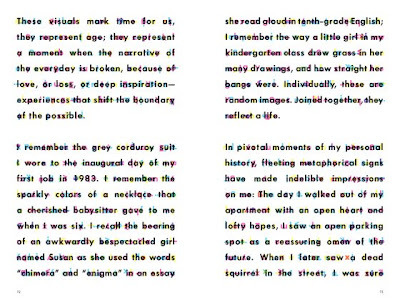 As I read, I found myself going back and searching my own memories from days past and how they intersect into my life today. 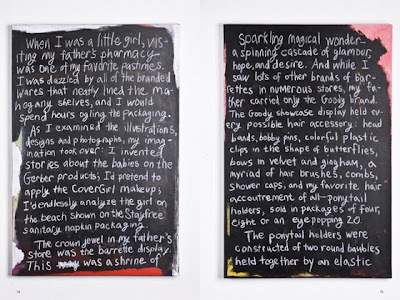 Each story is presented in a new typographical fashion, with many in a playful hand written style to modified abstraction layouts in all caps. I found the book to be full of intrigue, excitement and fun. Seeing how many of the simple things can shape where we are today, how items are tagged to our memories and experiences and to gain further understanding into how design and branding truly do shape our lives will be the lingering thoughts that make Debbie Millman's Look Both Ways a fun and unique read. The book is available at bookstores and you can read more about is debbiemillman.com. 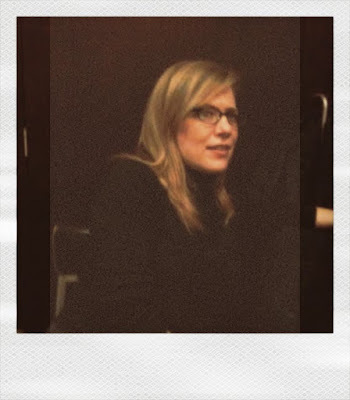 To meet Debbie Millman, she will be speaking this Friday evening in Orange County, CA. It promises to be an exciting evening. Look Both Ways: An Interview with Debbie Millman and Rodrigo Corral from Print on Vimeo. 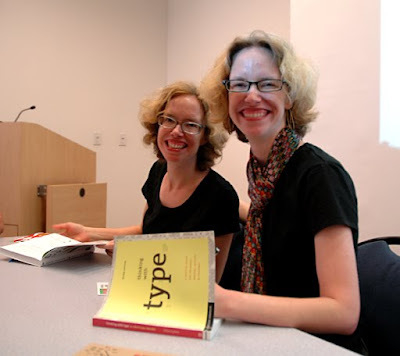 This week to celebrate Debbie Millman speaking in Orange County, I am devoting this blog to her many contributions to this profession that we all love, design. 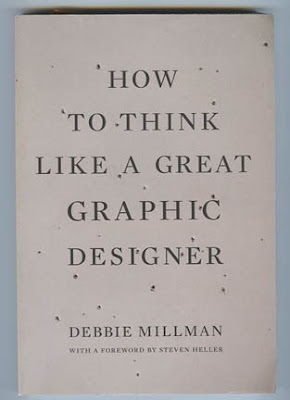 I will start with her first book, How to Think Like a Graphic Designer. A better title might be How to Thing Like a GREAT Graphic Designer because this book is full to the brim with interviews from the greatest in the profession. Designers that are covered in this book include Paula Scher, Michael Bierut, Milton Glaser, Chip Kidd, Stefan Sagmeister, Neville Brody, Jessica Helfand, Seymour Chwst, Stephen Doyle, Abbott Miller, Massimo Vignelli and many more. As you can see by that list, it is some of our greatest working today. The book seems to be a natural extension to the radio show that Debbie does, Design Matters. Design Matters is a series of hour long interviews with designers that gives you a better understanding of their accomplishments, how they got started, and their approachs and methods of design. Design Matters archives are available at the Design Observer site and on iTunes. I have a theory that for us to truly become great at what we do, we have to study not just design and its theories but also those that have come before us. We have to gain a better understanding of how to be a designer daily and what works and does not work from others. How to Think Like a Graphic Designer's interviews are smart and lively. Debbie's interviews give us the understanding that we need to step up to greatness as a designer. The book inspires you to design, to breath design in with a deep inhale, and is unjustifiably, a great read. To get your own copy check out Amazon or your local book story. This is a fascinating talk, from the good folks at TED, given by Pranav Mistry about how we can interact with technology. Mistry studies at MIT and is interested in integrating the digital informational experience with our real-world interactions. Pentagram has produced a nifty little web site to determine "what type are you?". 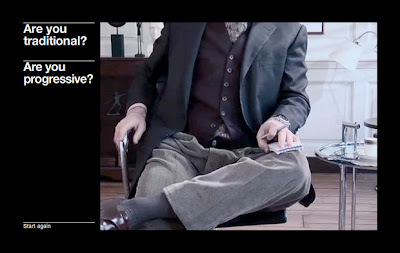 The site leads you through a series of short questions by a noted psychologist who keeps his identity secret. Once you have completed the questions he determines which font best describes who you are. So if you are designer who loves type and has thought that this passion is getting out of hand and even contemplated mental help for it, this may just be the solution for you. Try it out at this link on the Pentagram site. Project Team: John Rushworth, partner-in-charge and designer; Kirsty Whittaker, designer. Written by Naresh Ramchandani. Produced by The Brown Studio. Web development by Nerv Interactive. 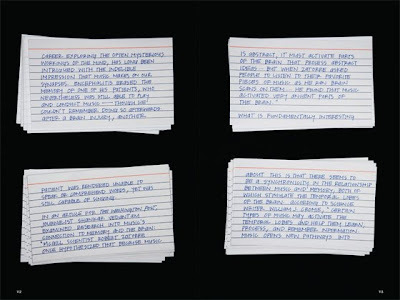 Next Friday evening, January 29th, Debbie Millman will be speaking at the Art Institute of California - Orange County from 6 pm til 9 pm. I am excited that Debbie will be giving a presentation titled: "Why We Brand, Why We Buy". 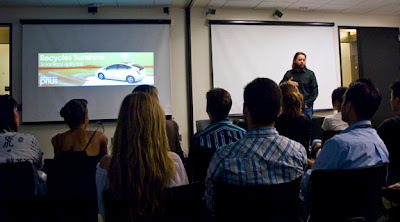 Debbie's visit is hosted by the AIGA student chapter at AICA-OC and AIGA Orange County. She is currently the president of the national AIGA. Details are available at the student chapter's website and myspace page. Sign up now, this event will be one you will not want to miss. Yesterday marked the 200th Anniversary of the birth of Edgar Allan Poe (January 19, 1809 – October 7, 1849). Having grown up in Baltimore, where Poe spend a portion of his 40 year life, I heard details of his life and works. 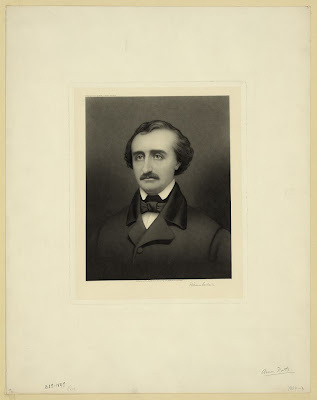 Poe is known for his poetry such as "The Raven" (the name sake for Baltimore's NFL team) and his short stories, "The Tell-Tale Heart," "The Fall of the House of Usher" and "The Pit and the Pendulum" that tell tales of horror. Poe is also created with writing the first detective novel, "The Murders in the Rue Morgue." On each anniversary of his birth for the last 60 years of so, three red roses and a bottle of brandy have been left at his grave site in Baltimore. This year it stopped. Another mystery has started as to why and another mystery has not been solved as to who has done this over the years. Read more about this story and view images at this link. 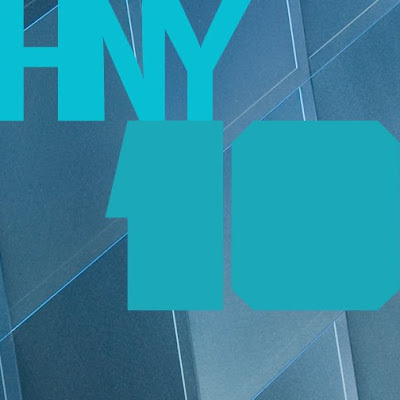 Brand New has posted a nice story on what they consider the most relevant identity work of the last decade. Review the whole story and all the logos at this link. Brand New covers the world of branding and logo work in a consistently excellent manner with current changes and options. Yesterday, I received a copy of the book Basic Logos published by Index Books in Spain. Two logos that we created where published in this volume, Blue Moth and our very own aNEW designs logo. The book will be available in the US in April. Look for it on bookshelves or at amazon. 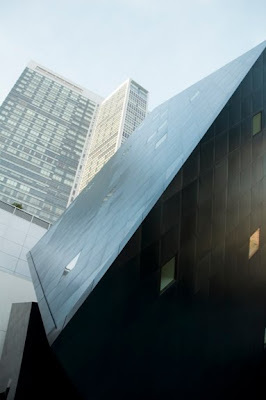 On a recent visit to San Francisco, I had the opportunity to visit the Contemporary Jewish Museum (CJM) designed by noted architect, Daniel Libeskind. 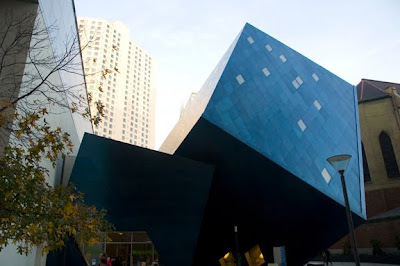 Libeskind become famous for his designs of the Jewish Museum in Berlin and his work on the site of the former World Trade Center. 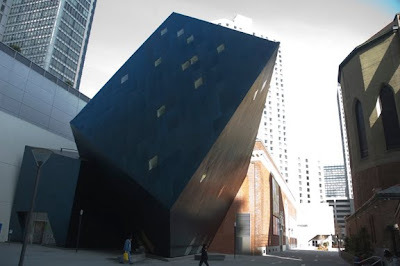 The CJM is a great museum located by the nearby SFMOMA and the city convention center. The design of the museum jumps into view as you walk into the area as the clad blue metal exterior shapes seem to grow out of a historic power station that has stood on the location for decades. "The site, a complex urban locus, provides the necessary pressure for the emergence of a unique form and energy. 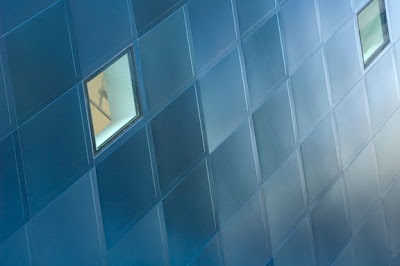 The CJM will make visible the relationship between the new and the old, of tradition and innovation. It will transform the physical energy associated with the legacy of the power station to the power of human communication and imagination. The building, though small in comparison to the context, will become a steel-clad jewel like a beacon glowing of the future." 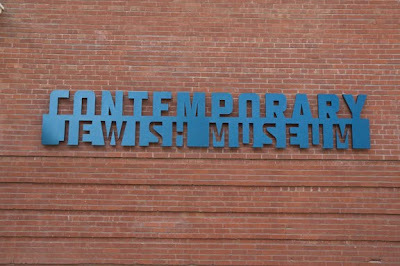 "The CJM building is based on the Hebrew word "L’Chai’m," which means "To Life." The two Hebrew letters of Chai, with all their symbolic, mathematical and emblematic structure, are literally the life source and the form of the Museum. In the Jewish tradition, letters are not mere signs but are substantial participants in the story they create. Thus the spatiality of Chai - a fundamental emblem of Jewish life - will be experienced as a full dynamic movement responding to the many levels of interpretation this word possesses." 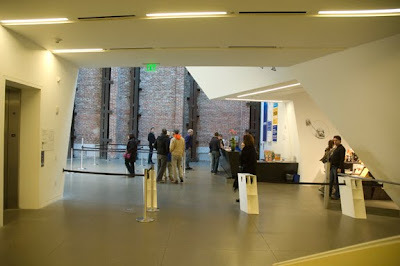 Upon entering the museum through the old doors of the power plant, one is greeted with again merger of the old and new with a white wall that angles and intersects the existing structure. 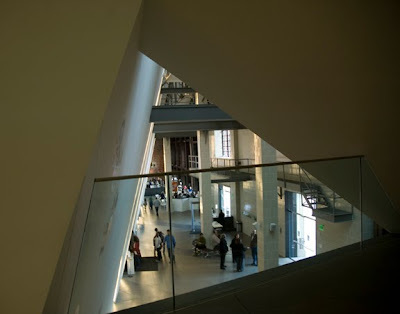 Angled stairs lead you up to room that forms the interior of the large square shape on the outside. 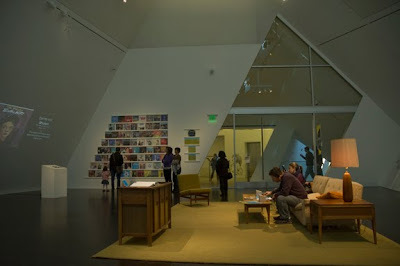 You enter this gallery space to find white walls that are punched by windows of rectalinear shapes. 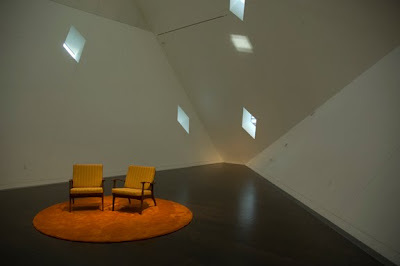 The space is large and airy and becomes a work in itself. 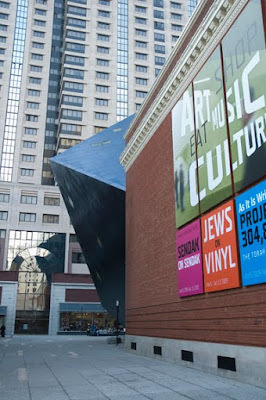 The Contemporary Jewish Museum has rotating exhibits in its spaces that show case modern jewish life. 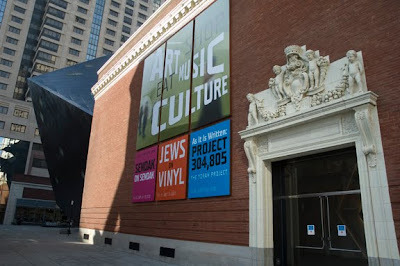 Currently showing is a great exhibit on Maurice Sendak until the end of this week; As It Is Written: Project 304,805, an exhibit on the writing of a torah scroll; and Jews on Vinyl, the history of Jewish recorded music from the 1940s to the 1980s. Above are several examples of typography that I photographed on my recent visit to San Francisco. Visual examples are always great to keep around for future use and walking a city will give you lots of inspiration. Take out your camera and shoot away. Your next great project may come from a great walk. During this holiday break I got to spend sometime up in San Francisco. San Francisco is one of my favorite cities and I will have several post coming over this week about the visit. 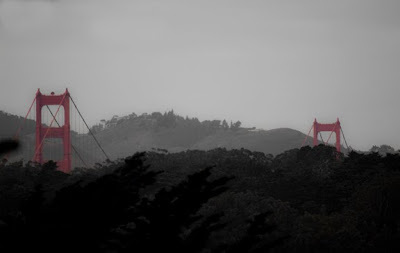 I took this photo above that I have titled "Sneak Peak" of the Golden Gate Bridge. More to come soon. We at aNEW designs wish you a happy, safe and health year. May your 2010 be a very good year full of creativity, great design, and pleasure in all you do. We look forward to bring you great things on the blog in the coming year and continuing to hear from you with your comments. Happy 2010!